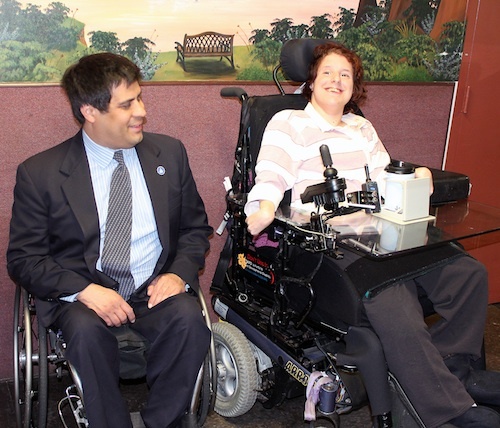 Patrick Scaglione visits with adult resident Jess Evans. Patrick Scaglione is very proud of Somerset County, NJ. The director of the Board of Chosen Freeholders likes to point out that Somerset “is recognized as one of the premier counties in the country,” and one of his primary goals is to work with others in government and the community “to promote the things that make Somerset County a great place to live and work.” That’s why Matheny is very excited that Scaglione will be a special guest of honor in the Lu Huggins Wheelchair Walk at Miles for Matheny on June 1. In preparation for the big day, he recently stopped by Matheny, took an informal tour and met some of our students and patients. He visited several classrooms in The Matheny School, traveled through all three residential wings and finished at the Matheny Center of Medicine and Dentistry, where more than 800 of New Jersey’s kids, teens and adults with developmental and intellectual disabilities have access to the best medical, dental and therapy care possible. Although rainy weather prevented him from visiting the Robert Schonhorn Arts Center, he viewed some of the Arts Access artwork hanging on Matheny’s walls and visited with some of the adult patients who created it. In addition to the Lu Huggins Wheelchair Walk, in which more than 100 wheelchair participants travel 1.5 miles around downtown Peapack with walking partners, activities at Miles for Matheny include a 5K Road Race, five different Cycling routes, a Kids Fun Run and The Friends of Matheny’s “Breakfast of Champions.” All funds raised support the Center of Medicine and Dentistry. Major sponsors include the Poses Family Foundation; the Golub family; Partlow Insurance; Peapack-Gladstone Bank; Porzio, Bromberg & Newman PC Attorneys at Law; BP Fueling Communities; Delta Dental of New Jersey Inc.; WCBS-TV and WCBS Newsradio 880. For more information about Miles for Matheny, log onto www.milesformatheny.org or call (908) 234-0011, ext. 260. This entry was posted in Uncategorized and tagged Board of Chosen Freeholders, Patrick Scaglione. Bookmark the permalink.